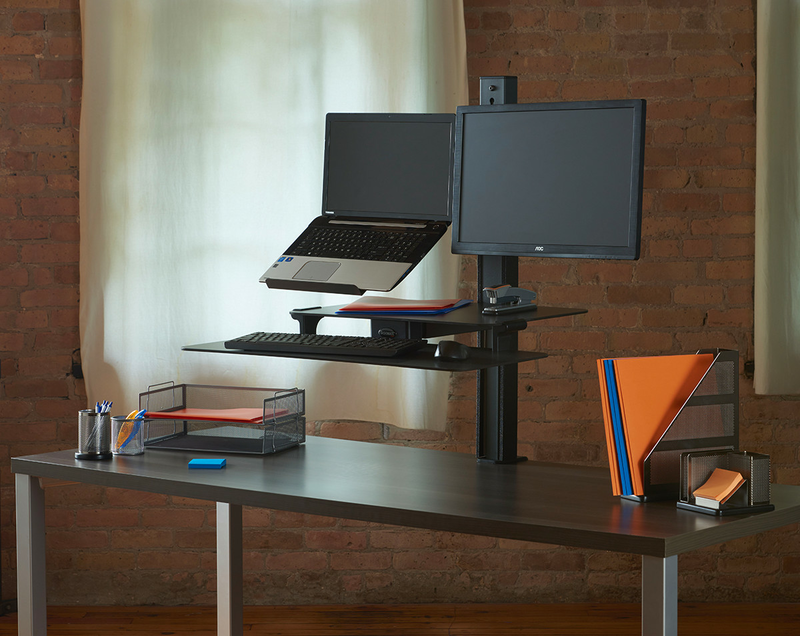 The TaskMate Slide Laptop assisted lift standing desk with laptop holder and monitor mount is purposefully designed to combine a spacious work surface and keyboard tray with the ergonomic features needed to maintain a comfortable, healthy position. This sit-stand desk locks into place, lowers flush to the surface of the desk, and utilizes an assisted mechanism that virtually eliminates the effort to lift the desk up and down. The rear clamping TaskMate Slide Laptop is a perfect fit for cubicle desks, small work spaces, and desks with front drawers. Individuals that prefer a large amount of desk real estate to travel with them as they go from sitting to standing will maintain a healthy posture doing so!